Posted: Thu Dec 04, 14 8:33 pm Post subject: Allotment-scale ridge & furrow? Thats sort of what if do but across the plot. Any reason for going across rather than longways? It just seems to slope slightly that way so presumably would drain better? 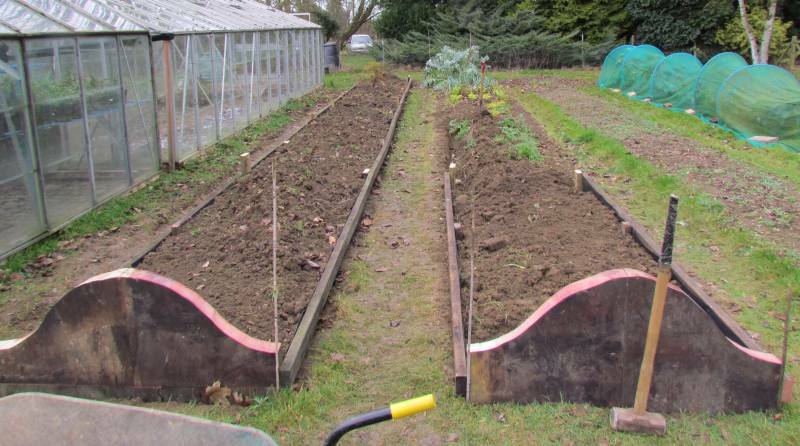 I was always too tight to pay for the shuttering needed to created raised beds on my allotment. So, I pretended, only walking on the 15" wide carpeted bits between my beds. The no-dig and mulching is certainly massively increasing the earthworm population though, and anything raised will need to be well-mulched over summer to stop it setting like concrete. Did I mention it was clay? less of a hike to the middle of the bed. not so far to walk around. IIRC Bob Flowerdew makes raised beds by shoveling soil into a pile and mulching paths with straw. Then when the straw rots shovels that on top of the bed and so on. Maybe I could channel my artistic side and do diagonal stripes? Mr Flowerdew's methods sound like my kind of style. If you look at where I've dug out docks and thistle, it's more of a Pollock at the moment. Compromise with a Herringbone,drainage and ease of access. I started with what I know as "lazed raised beds" - no formal retaining sides. 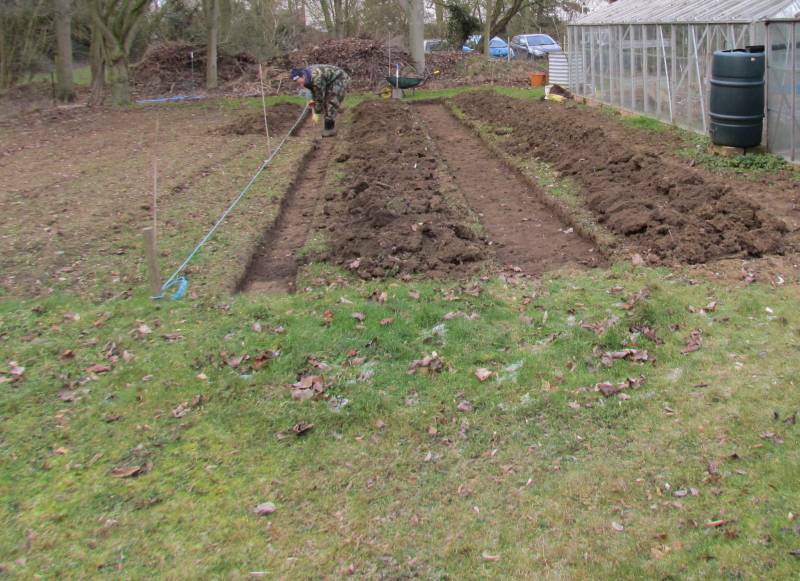 I dug out the paths, a spit's depth, and piled that soil onto the beds and that was that. Manure then added on top annually, some digging took place but not routinely. Heavy clay here, only any use for modelling!, the plot was land that had been rough grass for 50 years at least. 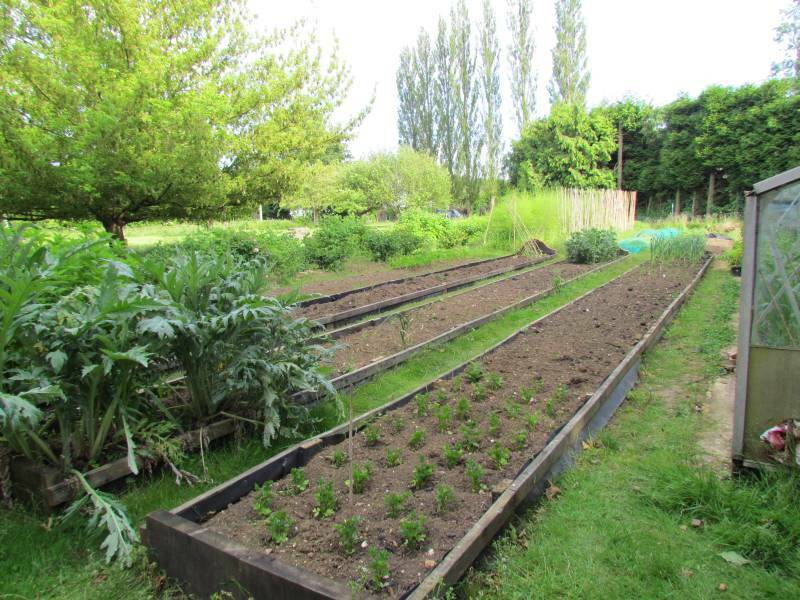 The beds drained well from the get-go and have improved as the soil structure has improved. We never walk on the beds which are 4' wide (touted as maximum easy reach when worked from either side). The plot is flat so the paths don't drain downhill, as such, but seemed to work to drain the beds by virtue of being a few inches lower. I let grass grow on the, lowered, paths which I mow once in a while as I find that works better for me than having any path coating that will pick up on muddy boots in winter (when I leave the grass fairly long to act as an absorbing layer). Only downsides are that the shoulders of the bed collapse into the paths, a bit, over a couple of years and need striping and piling back onto the beds; it is hard-ish to plant ON the shoulders so some space wasted; and no break-line between bed and path, so the grass from path tends to creep back into the edges of the beds. I came-across some timber a year or two back, so I've tarted mine up now, but they were fine for the half dozen years before that. I have just remembered that running along the far side of a long edge there is a (relatively v. small) field drainage ditch, I'll have to see if that goes anywhere but if so it seems an obvious place to drain in to.